Two long-time employees of the Emporia School District will be recognized today as Hopkins Award winners. Each recipient received a $2,000 cash award donated by the Hopkins Foundation. The awards were presented by Michelle Hopkins-Molinaro, vice president and managing director of the foundation. In addition, each honoree received $1,000 to spend on something to benefit a school or district program. 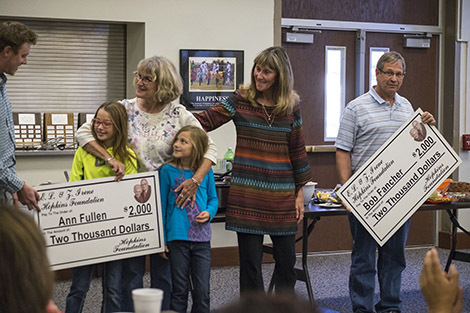 Since 2002, the Hopkins Foundation has given approximately $360,000 to 185 teachers and support staff members in the Emporia schools. The awards program was a dream of Molinaro’s grandfather, E.L. Hopkins, as a way to reward educators. Hopkins Award nominations are submitted throughout the year. A selection committee meets at least quarterly to review nominations and select winners. All winners receive a $2,000 cash award to be used any way the recipient wishes, plus a $1,000 cash award to use toward a school district project of their choosing. See list of past Hopkins Award winners from the Emporia Public Schools.